I love Dungeons & Dragons enough to spend money to write a blog about it, but I dislike some elements of fantasy role playing. Perhaps “dislike” is too strong. I don’t want to squash your fun. This is not a rant; this is a cry for help. Help me understand the appeal of these 9 aspects of our hobby. Underwater adventures. At some point, every dungeon master desperate for a new idea hits upon the underwater adventure. Many are so hard up for material that the concept seems promising. Don’t feel bad; in 1977 similar desperation reached the professionals in the Happy Days writers’ room. Soon, players are fighting seafood and creatures in seashell bras. Resist this impulse. You treat the sea with a measure of respect, and you wind up with guys in flooded armor swallowing “air pills” or something, but still unable to speak and thrashing as uselessly as fish in a boat. Even the chainmail bikinis rust. You use magic and hand waving to simplify the environment to the Spongebob version of underwater. Spongebob is the guy who lives under the sea, lights fires, and has a bathtub. I can tell you what underwater adventures would really be like. You would drown. Mounts. I get that your warhorse has intelligence 6, uses the litterbox, and takes sugar with his tea, but must you insist on riding it underground? Do you know how tall a warhorse and rider is? How will you fit the damn thing through the doors? Whenever I DM for a guy with a mount, he insists I decide between (a) making the dungeon into the equestrian version of handicap accessible with 15-foot-tall doors and ramps between levels or (b) being TOTALLY UNREASONABLE and NERFING HIS ENTIRE CHARACTER CONCEPT. I know that some specialized D&D campaigns offer plenty of opportunities for Silver to join the fun, but folks who want to bring their horse in the house should probably be playing Bella Sera. Druids. Let’s see. I can select a class that can turn invisible and throw fireballs, or I can play a druid and cast Warp Wood and Shillelagh. I’ll stick with spells I can pronounce and that also damage more than the woodwork. To make things worse, druids become ineffectual underground—in a game with a name that starts with Dungeons. Do druids sound good to you anyway? In original D&D, you had to battle other druids to reach high levels—as if there were a shortage of trees to hug. Oh, and all the other players have to put up with all your tiresome tree hugging. Limit your retinue to one pal. I have literally run tables where the pets outnumbered the characters. If I had attempted to realistically role play the scene where the zoo enters the tavern, the campaign never would have reached scene 1 with the patron at the bar. Know the rules for your creature. If rule (2) where actually enforced, no one in the history of D&D would have ever played a character with a pet. Bards This. Enough said? I played a bard once in a 3E game. My character stood in the background and I had to imagine that my lute strumming helped the party. To be clear, “lute strumming” is not a euphemism, but if it were, my contribution would have been just as useful. No one remembered to apply the bonuses coming from my musical inspiration. Fourth edition improved matters by making bards into musical spell weavers who pretty much operate like every other PC in 4E. I once played with a guy who re-skinned all his bard powers with the titles of Metallica songs. At least I think that’s what he did. In 4E, (a) no one understands what the hell anyone else is doing on their turn and (b) in 4E most power names already overlap with the titles of metal songs. Furry races. Exhibit A: Spelljammer. This setting includes anthropomorphic hippos and space hamsters. Jeff Grubb writes, “The infamous giant space hamster also came out of ship designs. The gnome ship looked like a galleon and a sidewheeler slammed into each other. Someone asked what the big paddlewheel housings were for, since there was no air other than in the air bubbles. I said they were giant hamster wheels. Roger Moore (editor of Dragon) thought that was hilarious and it was off to the races with the giant space hamster. So I’m not taking the fall for that one by myself.” Exhibit B: Runequest. This game featured the most sober, serious world building this side of Empire of the Petal Throne. 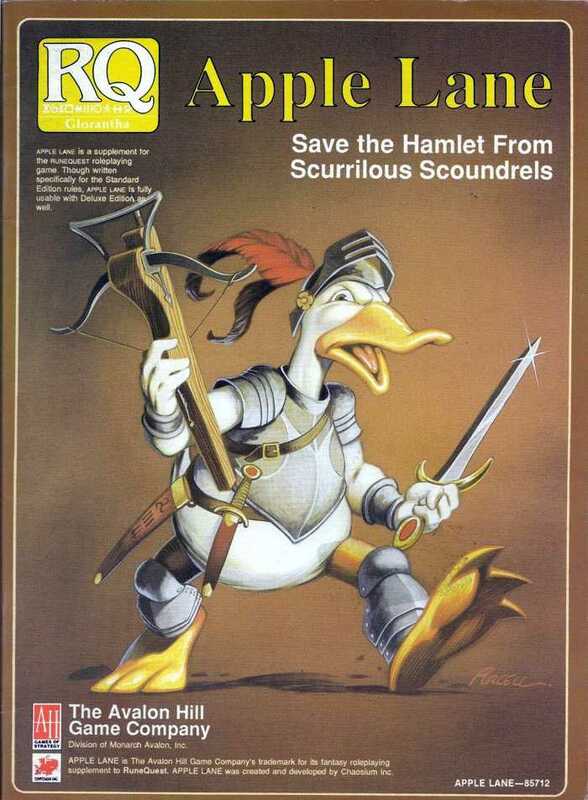 I love Runequest and would probably be writing a Runequest blog now except that the setting included anthropomorphic ducks like Donald and Howard. Ducks! Sorry. Deal breaker. I like to dress in character, so according to THE MAN, I need to choose a character wearing pants. This entry was posted in Uncategorized and tagged bard, D&D Championship, druid, Forgotten Realms, Greyhawk, Jeff Grubb, Mud Sorcerer’s Tomb, puzzles, Runequest, Spelljammer, Spongebob, Tunnels & Trolls. Bookmark the permalink. I was with you until the gratuitous slam on ducks. RQ ducks were awesome. I think ducks were some sort of test — if you couldn’t handle ducks, you weren’t ready for RQ. Or something. Let’s not mention the playable anthropomorphic baboons or tapirs. I hated ducks but found them easily ignored and replaced. Then again I hated Glorantha and ported my game over to Harn at the first opportunity. 3e druids were badass, especially with some of the expansions, but 1e were indeed lame. Druid tanks in 3.5 are horrendously unbalanced. They went from one end of the spectrum ALL THE way to the other. Como es la configuración de tanque Druida? Most of the distaste you sense comes from me being deliberately cranky for comedic effect. Even though I’ve played every D&D edition since 1977, I’ve played and DMed more fourth edition than any prior version. I’ve DMed hundreds of hours of Living Forgotten Realms events (and 3 hours of an AD&D RPGA event), and almost always had fun. I think 4E brought some great ideas to the game, but also suffered because some new aspects proved half-baked. See my posts on skill challenges for an example. Sometime, I will do a point-counterpoint post explaining why 4E is the best/worst D&D ever. As for greed, even D&D top-banana Mike Mearls admits that in the early years of 4E, the company flooded the market with too much material, but I think the company’s income expectations have evolved. I’m still amazed that Hasbro has granted the D&D team almost two years of minimal revenue to get the next edition right. Now, if only they heeded the design advice I provide for free right here! 3.5 Campaign at level 20. Hill Giant Bard with with a returning boulder and 18 Charisma. Best bard ever. A well written article. And yes, so many of these concepts move away from the classic game concept – which would be a deep and dreadful dungeon. Leave the dungeon and the game changes. Sometimes drastically. Think about the feeling a dungeon evokes. Wandering through claustrophobic places. In the dark. Lack of air. Dangerous attacks in close quarters. Traps. Then compare that feeling with each of the concepts above and see if they fit. They mostly do not – being lighthearted, silly, or else not suited to the dread of the underground. I am not saying that these concepts would not please certain players. But it represents a drift away from the original, gritty version of the game. Listen and Play with the classic dungeon podcast. No giant hamster people. I assure you. Hi David, I have taken to heart your words about asking for help. I’ll try to explain three things from your list that I happened to like. The short answer about Druids and Bards: they’re good as much as you like Celts. Anything from “The Cattle Raid of Cooley” to “Asterix and Obelix” can result in love with this culture. I’m serious, it can shape one’s feelings about character options. The long answer is much more personal. I grew up reading pretty archaic folktales about magical dudes walking in a forest and turning falcons/wolves when they need to help someone. As a kid I haven’t heard about guys bearing books to prepare spells at every dawn. Even though I enjoyed “Harry Potter”, in my mind the idea of magic education with Intelligence-based utilitarian spells is strongly associated with the Age of Enlightenment. I’m a sucker for Bronze Age and Early/High Middle Ages, at least for now. When I was a teenager I didn’t knew about D&D, I knew video games. My favourite RPG class always was a wizard (I’m one of the biggest fans of staff-wielding levitating elves wearing dresses who insist on calling it a robe). But peculiar thing happened: I’ve seen fireballs in every video game with mages, but I don’t know about any fairytale with hero throwing great balls of fire that was written before Jerry Lee Lewis. For me fireballs are… videogame-ish. It is just a killing exercise, hand grenade for fantasy. Don’t get me wrong: it could be fun. Right now I’m playing as a Wizard, and he will learn fireball and levitate as soon as he will reach 5th level (it will be sooo much fun!). I’ve never played D&D as a Druid, but when I look at his spells, it’s… isn’t that deadly, but it is breathtaking. Conjuring a storm is not just a 1256 square feet of flame, it’s a manifestation of nature, a breath of the world. Levitating is awesome, but turning eagle feels like being a wizard as our ancestors imagined it. And despite cool kids will surely mock me for that, I find cantrip “druidcraft” fascinating. You can make a leaf bud bloom. For me it is not a cantrip, it is a miracle. Any human can recognize it as beautiful, not lethal. Heck, the only reason I don’t play as a Druid is that I’d probably spent all my actions to bring Spring instead of adventuring. …and you can always say “Screw you guys, I’m going home” and depart to the woods. Bards bring mentality which links music and magic. When I think about Orpheus, Freddie Mercury, Robert Johnson, or Snorri, I imagine perfect bards. Bards aren’t bound to be late medieval troubadours, they can take form of skalds, law-speakers, blind poets. For me Bards and Druids are wonderful interpretations of being a mage in archaic world. They do not need to rely on spellbooks, they learn it from nature or art. Nothing of it works if the player really wants this 8d6 fire damage. It’s fine, wizards really nailed it. And about the Ducks race in Glorantha: I think they perform the same role as playable kobolds in Forgotten Realms. It is smallest race with plenty of enemies. It is terrible choice for building powerful adventurer and I like it, because many epic stories are told from perspective of inferior, small character – and in works perfect. It leaves the question “Why furry?”. They could make weak race without animal features. For me the answer is “Because they look ridiculous”. They act as a barbaric tribe of storm god worshippers, but they are stupid ducks. Nobody will take them seriously. And it gets better when you learn that Ducks are natural enemy of undead. They live in a marsh with plenty of corpses, and when some necromancer raise them, the Ducks are the first to fight. I don’t think they are inadequate to Glorantha. It is based on myths, and myths usually have absurd parts. I mean… in Glorantha priests of knowledge god Lhankor Mhy must wear beards, and priestess must wear a fake ones. It is a funny world. And yes, I can’t see any justification for other furries. I wonder if it will help you. Frankly I don’t think it was very convincing. Druids = Wilderness adventure instead of a dungeon crawl. Bard = Political and urban adventures instead of a dungeon crawl. I’ve noticed the same. My current group as a player had a Druid and has a Bard – out in the wild or in town (respectively) they were fantastic. In the cave complex, going after greenskins, they certainly weren’t useless – BUT the Warlock, Ranger, and Paladins carried more of the effort. Likewise, a Druid that focuses on being a caster instead of a shapechanger has some great selection even for underground. Ultimately, your character should be made at the table at session 0 once the DM has described the setting and adventure/campaign type. That way, players are less likely to make a character who doesn’t “work” in the setting.